We have just completed a review of capital raising and M&A activity in the financial technology sector in 2017. 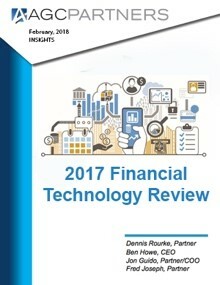 While overall capital markets activity improved over the broadly lackluster environment of 2016, financial technology continues its grinding transformation to the fintech platforms that we expect will rule the financial services landscape of the future. Challenger business models are on the rise across the globe, and the financial services giants are again spending real currency (and occasionally Bitcoin) to increase their stranglehold over the means of production, and choke off the startups. This report includes an overview of M&A and investment activity, current trends, and our landscape of companies in the ecosystem.